It has been quite some time since there has been an update to the DOG Aviation Blog … mainly because no real work has been accomplished at the hangar on the RV-12 since the last work session. The lack of activity has, in large part, been due to sheer laziness mixed in with the cold weather. Another contributing factor has been Mike needed to have his kerosene heater back for a project he was working on … so I lost the heater the latter part of December to early February. Granted, I could have toughed it out and worked anyway. But the RV-12 is built and it does fly nicely, so there is no real sense of urgency …. plus, admittedly, there has also been some project burnout. Truth be told, not many good flying days have been missed … probably around 10 at the most since late December … and most of them were days in February. Overall, although the winter here has been mild temperature wise and there have not been any massive snows, it has not been good flying weather. By in large it has either been rainy, foggy, snowing, socked in with low clouds or just way too windy for test flights. So in the interim have been working on other RV-12 related items from the house such as making new checklists for a knee board, modifying an Excel weight and balance calculator to better suit my needs and kicking around ideas for the paint design. 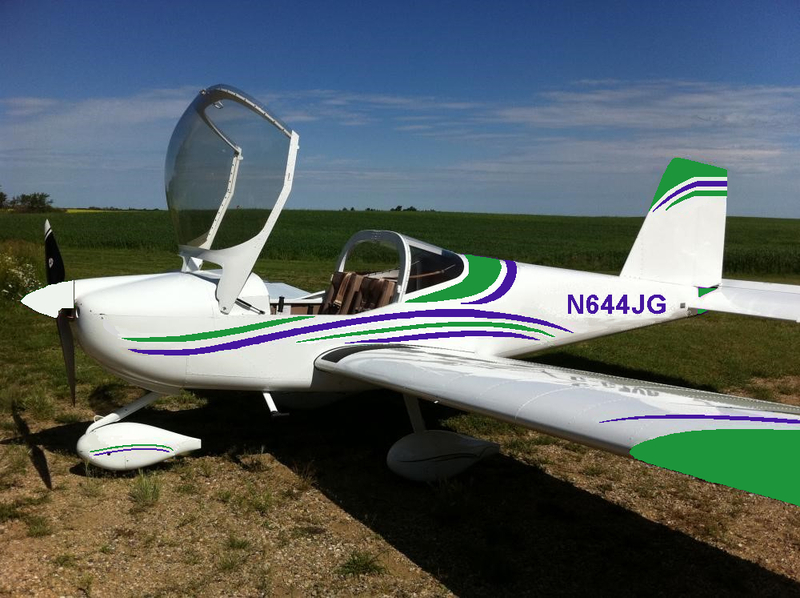 I was lucky enough to find a photo on the Internet of a side view for a completed Canadian RV-12 that was mostly white to use as the canvas for my paint scheme. It already had a couple of paint lines that were similar to what I had in mind … so I just added and modified the photo a bunch to come up with what I feel will be the overall design for the paint scheme to be used on the DOG Aviation RV-12. The design consists of sweeping lines along the side of the fuselage and wheel pants. Behind the rear window there will be two trim lines of paint around the turtle deck. The wing tips and tips of the horizontal stabilator will have identical outer edge trim markings. The trim on the vertical stabilizer will be similar to that on the wing tips with the addition of an additional trim line. The only thing up in the air is the lower trim line on the fuselage just above the wing … may eliminate that line altogether … but will need to edit the design to see how it looks that way. Choosing colors for the paint scheme is a whole other issue to be sure. Seemingly, the vast majority of builders gravitate towards paint schemes consisting of red, white and blue … and/or combinations thereof. Early on, while building the DOG Aviation RV-12, the decision was made to choose a color pallet a little less mainstream just to be different. Frequent readers of the DOG Aviation Blog know the flap handle, instrument panel and steps have been powder coated with a vibrant deep purple color and the stitching for the seats and baggage bulkhead cover was done using green thread. I have always envisioned the base color of the RV-12 to be a light off white cream color that leans towards a brown and not a yellow …. think of a 50’s hot rod cream. Originally, the thought was to have green as the major trim color with deep purple as the accent color … but now I’m not so sure of that. While playing around on the computer, I reversed the colors making deep purple the trim color and green as the accent color and think I like that better. Then to really confuse the issue I played around with orange as an accent color to the purple. Below are the three color schemes that are the likely choices for the paint job. Bear in mind the white that is on the airplane in the photo IS NOT the off white I’m thinking about for the final color. Of course, all this is just the rough doodling … the final paint scheme will have all the curves and trim lines evened out and the final colors will likely be tweaked somewhat as well. This is how I first envisioned the paint scheme … the predominant trim color of a vibrant green with deep purple accent. Playing around with the colors decided to try reversing the colors making the predominant trim color deep purple with green as the accent color. I think I find this more appealing than the previous paint scheme and at this point in time, will likely use this as the color scheme for the DOG Aviation RV-12. On a lark while playing around with the paint scheme colors, decided to try using a purple and orange combination. Doubt that I will paint the RV-12 using orange as the accent color because the "RV-12" stitching on the seats and "EXPERIMENTAL" stitched onto the baggage bulkhead cover was done using a green thread. The stitching would need to be changed to orange for a cohesive look both inside and out. I do find this paint scheme quite alluring … have to admit, I really do like it a lot. At the hangar, the RV-12 is still awaiting the instillation of the “Bender baffle” modification. There are also wheel pants need to be installed as well … so need to get on that project soon so it is completed prior to paint. As that work progresses, will also be working on an alternative mounting location for the voltage regulator … so there is still lots of work to do in the coming weeks. Purpose of this Blog is to document the assembly of a Van’s RV-12 Light Sport airplane from a kit using flush rivets. I’ve elected to build the RV-12 an E-AB (experimental amateur built) aircraft so flush rivets can be utilized during construction and modifications typically incorporated after building can be incorporated into the build. The RV-12 is typically built as an Experimental Light-Sport Aircraft (E-LSA) assembled by the builder from six parts kits plus a fastener kit containing all the rivets for the entire airframe. Together the kits contain all the necessary components to build a complete flyable airplane ... airframe, engine and avionics. Retired from communications industry with 32 years experience in electronics, large systems computer repair and fiber optic networks. I have always enjoyed airplanes and been a longtime member of the Experimental Aircraft Association (EAA) which hosts an annual week-long air show in Oshkosh Wisconsin called AirVenture. (If you have any interest in aviation (new or old) visiting Oshkosh for the show is a must do ... almost a right of passage). Building an airplane from a kit has been a long time desire. After attending AirVenture annually for 25 years or so and seeing kit airplanes making quantum leaps in quality and completeness, I decided the time was now or never for building my own. I’m not jumping into the project with cold feet. Prior to the recent relocation to Ohio, I had been helping a friend of mine with the building of a Van’s RV-9A which is now fully constructed and took to the air April 27, 2013. I really enjoyed helping with the assembly of the RV-9A and was able to see first hand the quality and fit of Van’s kits … so choosing a RV-12 kit for myself was an easy choice. Plus, it is the type of kit which requires very little extra help during construction. Unfortunately, due to a legal industry focused on making others pay for their client’s dim-witted mistakes or bad fortune, disclaimers are a distressing necessity. a. Relating to or based on experiment: experimental procedures; experimental results. 2. Of the nature of an experiment; constituting or undergoing a test. 1. A person who engages in an art, science, study, or athletic activity as a pastime rather than as a profession. 2. One lacking the skill of a professional, as in an art. The author disavows any connection with Van’s Aircraft and stresses construction methods and procedures employed during the assembly of the author's RV-12 airplane kit, produced by Van’s Aircraft, are not in any way to be connected with Van’s Aircraft official documented instructions. Therefore, by no means should readers of this Blog interpret the content therein as approved assembly procedures or official instructions by Van’s Aircraft. Construction techniques, comments, suggestions, experiences, design modifications, product usage, and photo displays contained within this Blog, are in no way to be construed as approved methods or instructions for assembling the RV-12 airplane or any other aircraft. This Blog, and the information contained therein, is solely for the purpose of documenting the assembly of MY kit RV-12 airplane produced by Van’s Aircraft. Before utilizing anything seen or read within this Blog, consult with a trained, licensed and approved aeronautical professional not an amateur, such as myself, experimenting.